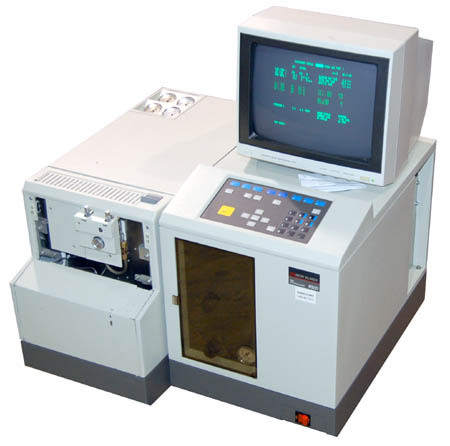 Microprocessor controlled gas chromatograph for capillary and/or packed column use. Soft key user interaction by keyboard and VDU. Single or dual detector operation with wide choice of detector, injector and pneumatics combinations. Analytical method storage. Up to 10 analytical methods can be created and stored, with battery backup for long-term security. Automatically corrects for column bleed during temperature programming. Allows single column operation with ionization detectors for both packed and capillary columns. The chromatogram of selected channel may be displayed on the screen during real time. Screen replot with time scale expansion and sensitivity changes is also optional. Keyboard includes eight keys immediately below the screen. Theses are assigned different functions for each display giving maximum versatility. Provides for percent, normalization, external standard and internal standard calculations on an area or height basis with peak naming and peak grouping. Automatic calculations of response factors. Storage and re-integration of raw data after completion of the analysis. Standard data handling facility provides single channel integration which may be switched between two detector signals during an analysis for appropriate dual channel applications.